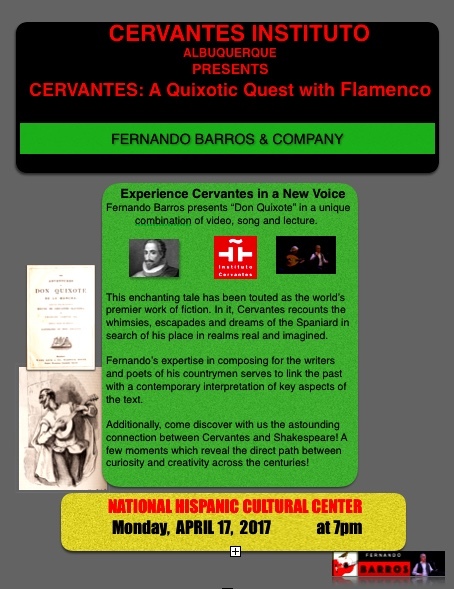 Experience Cervantes in a Voice Fernando Barros presents “Don Quixote” in a unique combination of Video, song and lecture. This song is from Cervantes’ poem, “Bailan las Gitanas,” well before the genesis of flamenco and the identification of the gypsies (gitanos) of Andalusia as an outcast class of society. Ironically, the prevailing romantic ideal of nomadic life is evidenced in this poem because the queen is full of jealousy for the freedom and passion of the gypsy girl. The rhythm of this song is tango (ngo), African in origin, as is the fandango, a style you will hear later. Its melody was originally played on the oud, not the guitar. Flamenco is a relatively new music genre from the 19th century, springing from the European Romantic movement. 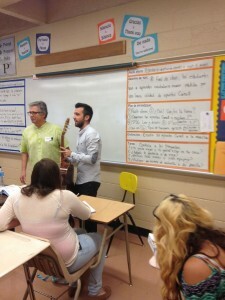 It has been highly influenced by the many diverse cultures/musical styles/and instruments of the Mediterranean region. Its initial cultural impact was via the power of the voice, as in all oral traditions, and later was to be marked by three elements: rhythm; melody; harmony. 3. Relevance of D. Miguel De Cervantes. Known today as the first modern novel and Cervantes as the “man who invented fiction” for its unique presentation of the fantastical mind of a fantastical character – Don Quixote – as he attempts to make real his visions and ideals. We will present Cervantes’ self portra it in two artistic forms utilizing his own words. Crippled, graying, with a discernible stutter and almost toothless, Cervantes is self-described in this edgy, contemporary compliment to Fernando’s composition. The video was created by David Zerep, who graduated last year from the Belles Artes University in Granada, Spain. 4. Presentation of Quixote in English with Illustrations from our book; our book was one of the first in the 1700’s. It is an ideal example of artistic inspiration and collaboration. The first publication in English was in 1612 for volume 1 and 1620 for volume 2. Original Spanish editions were in 1605 and 1615. + As a stellar example of the evolution of language, our title tonight is taken from a word formed from Cervantes’s title: QUIXOTIC – both a verb and an adjective! The malagueñas were sweet songs hidden and protected for centuries by the muslims in the mountains of southern Spain and serve as inspiration for a form of flamenco dance we know today. FIVE DEAD CHARACTERS ON THE STAGE! 7. “Epitaph of Don Quixote and Dulcinea” – As you have observed , Carlos has changed instruments throughout our presentation, based on Fernando’s compositions or the era from which a melody originated. He is inventing a new method whereby he is adapting flamenco for the oud. Our simple overview of “Don Quixote” ends with an ancient Sephardic lullaby (a durme), which evolves into flamenco style. 8. Thank you to DON ANASTASIO SANCHEZ ZAMORANO of the Instituto Cervantes and to the staff of the National Hispanic Cultural Center for hosting us tonight!